There’s nothing new in those marketing ideas because that’s what most probiotics do. However, nearly every probiotic supplement (including iFlora Multi-Probiotic) can only advertise general health benefits, not make specific health claims. That’s where this website can help you because, when possible, I’ll help you decipher the ingredients and show you what research backs up the claims. It also comes in a powder form. The 16 probiotic bacteria in this supplement are all mixed in a proprietary blend. As such, you don’t know how much of each bacterium you are getting. So you don’t know if they are at levels high enough to be therapeutic for your conditions. The only known strain is Bifidobacterium lactis HN019, and you don’t know how much of that or any of the other bacteria are included. However, if there is enough HN019, then the researched benefits of it may apply to this iFlora supplement. However, since it takes a village of microbes to be healthy, this probiotic supplement does deliver a variety of bacteria, even if the average amount of each bacteria in a serving is only 2 billion CFU (32 billion divided by 16 kinds of bacteria). The 32 billion CFU are guaranteed at the time of manufacture, not at the end of the shelf life. So if this probiotic supplement is exposed to high temperatures or humidity, you may open it for the first time and have less than 32 billion CFU. Marketing materials also say that it is shelf-stable. Although I almost always recommend that you refrigerate probiotics, the statement that it is shelf-stable lets you know it should be fine out of the refrigerator and in indoor temperatures for short periods of time. This probiotic comes in capsule and powder forms. The powder form can be mixed in cool liquids or cool soft foods such as applesauce or yogurt. NutraFlora scFOS serves as food for the bacteria in the beginning part of your colon (for the most part.) An unknown amount is added as a prebiotic. NutraFlora scFOS is a short-chain fructooligosaccharide, a short-chain of predominantly fructose molecules derived from cane or beet sugar (fructose intolerance alert!). Some people have gastrointestinal reactions to this FOS. A concern to me personally is: what is NOT in it is NOT listed. 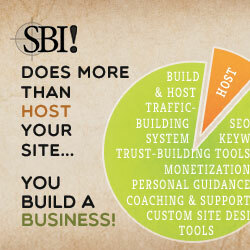 Especially for clients, I like to know if a product is gluten-free, is dairy-free, is soy-free, etc. I like to see that mentioned right on the label so they know that they are safe. According to the Sedona Labs rep, the product tests negative for gluten, dairy and soy, but they will not say it is 100% free of those things. Of course, saying something is "gluten-free" doesn't always mean it has no gluten in it, but just that the amount is less than standard measurements. If you are sensitive to any of those ingredients, you will have to decide if this product is right for you. 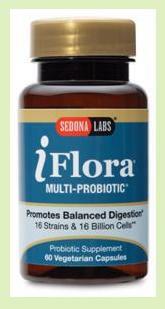 So Should You Take iFlora Multi-Probiotic? Is this probiotic supplement the best probiotic for you? You have to look at the different bacteria included, the other ingredients, and the dosage and see if it might fit your needs. Nutritional consultations can help with your decision. If you look at reviews from many sites, you will see that many people love this supplement. The “yays” outnumber the “nays”. from my online dispensary, along with other quality products, at a discount. Here are my reviews of other probiotic supplements.